Everyone has qualities which can make them frustrating to some, but there are also qualities within everyone which makes them inspirational. Whether you nurture these qualities is entirely up to you, but they are there within each of us. 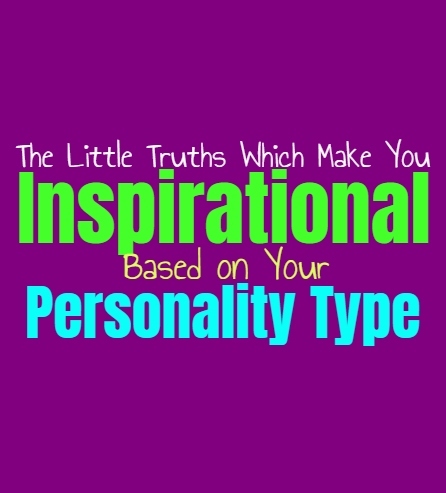 Here are the things which can make you a true inspiration, based on your personality type. INFJs have an incredible way of making others feel soothed and appreciated, especially when they are in need of this. They can see beyond a person’s surface and deep into their being. This ability to see past the shield is something which makes the INFJ capable of connected with others, and really bringing them into their special bubble. This is a truly inspirational qualities, and is something which should be nurtured in the INFJs spirit. They can see the best ways to make someone believe in themselves, even though INFJs cannot always do this for their own confidence. ENFJs are giving and supportive people, who have this ability to push through and make things happen. They are perfectionists but they only do this for the sake of making those around them proud. This ability to always strive for perfection in even the smallest of things, is truly inspirational. Even when the challenges seem to be too much, the ENFJ continues to push and work even harder to juggle everything. This is not only impressive, but truly inspirational. It shows the rest of us that we are capable of far more than we realize sometimes. INFPs have a truly unique way of looking at the world, which is definitely an inspiration. They see things filtered through their own sense of morals, always striving to find what is right and true. INFPs want to follow their hearts, even if sometimes this gets them hurt or causes people to misunderstand them. They go for what they know is right no matter what the rest of the world tries to tell them. This might not always be an easy path, but it is certainly something which is inspirational to those who might wish for the strength to always fall their own beliefs. ENFPs are inspirational because of their vibrant spirits and their ability to go after what they desire. They follow their hearts even if this sometimes leads them down risky paths in life. ENFPs are enthusiastic about life and ready to explore whatever brings them the most joy and excitement. They are strongly moral people, even if others don’t always understand their sense of morals and honesty. There is something deeply inspiring about the way ENFPs live with passion, even when others don’t completely understand it. INTJs search for truth in a way that cannot be altered or compromised by others. They believe in looking at the facts and being completely honest, even if it offends or upset those around them. This is truly inspirational in a world filled with so many lies and twisted half-truths, since the INTJ continues to search for ways to remove ignorance from their world. This is not only inspirational but is a deeply noble and useful goal, one that many people could benefit to learn from. ENTJs are very focused people who go after what they want without allowing anything to stand in their way. Their ability to push towards their goals with a sense of efficiency and confidence, is definitely inspirational. It proves to the rest of us that we can accomplish our goals if they actually try and continue to push ourselves. They don’t give up even when things are challenging, instead they just find others way to make these dreams come true. INTPs are not afraid to think outside of the box and explore options which others are unsure of. They don’t need everything to be proven for them to consider the possibilities. This is something which makes the INTP both inspirational and unique thinkers. Their minds are always considering different angles and possibilities, and are highly capable of imagining so many different things at once. They might not always be easy to keep up with, but they certainly are inspirational. ENTPs are not afraid of a challenge, they even have a tendency to search them out. They want to be able to push themselves out of their comfort zones in order to learn and really grow. ENTPs are willing to explore the other side of their debate just to uncover the truth behind it. They have this natural ability to see all of the angles and come to more logical conclusions because of it. ENTPs will speak their minds openly without holding back, and this is certainly an inspirational quality. ISTJs have this incredible sense of work ethic and believe always striving to do their best. The truth is this often comes from a deep desire to be able to care for and provide for their family, making it more than just about work. This is definitely an inspirational quality, something which many could benefit to learn from. ISTJs will take on the difficult task, because they know it needs to be done and they don’t feel like they are too good for it. ESTJs are strong-willed people, who speak their minds and go after what they want in life. They almost always know where they want to be and what they want from life, and this is definitely inspirational. For some of us it can be challenging to be this decisive and uncover what we really want, but for the ESTJ this seems to come naturally. They figure out what they want and they do whatever it takes to make this happen. ISFJs are kind people who almost always consider how their actions will affect those around them. This constant sense of compassion and desire to make others feel comfortable, is both a wonderful and inspirational thing. If more people in the world cared as much as the ISFJ does, than we would live in a far better place. They want to ease the suffering of others and truly hurt when they witness pain in those they love. ESFJs have a strong desire to please those around them and care deeply about making them happy. This desire to constantly help others and do it even when they are struggling, is definitely inspirational. ESFJs often push aside their own hurt and continue being strong so that they can take care of everyone else. While sometimes they need to take a step back and think of themselves, they rarely do. This is something which makes the ESFJ inspirational, and also truly impressive. ISTPs are logical people who are more than happy to correct people when they are inaccurate about something. They don’t do this in an insulting manner, instead they just believe in educating and spreading the truth. Something truly inspirational about the ISTP is the fact that they don’t simply believe anything they hear and want to take the time to really research and be sure before they trust something. This is something many people could learn from, since believing in everything leads to being completely ignorant about the truth. ESTPs are adventurous people who are willing to take risks in order to experience what they want in life. This is definitely an inspirational quality, one which makes ESTPs fun to be around. They are willing to take their loved ones on these adventures and actually enjoy bringing them into the excitement. ESTPs live their lives with a sense passion and are willing to take risks even if they seem a bit frightening. ISFPs follow what feels right even if it is something which can get them into trouble. They can see the beauty in the world around them and believe in searching it out when they can. These are truly inspirational and wonderful qualities, ones which make ISFPs sincerely special people. They follow their own sense of morals and right and wrong, even when it seems difficult or is something others cannot understand. ESFPs are joyful and fun people, always searching out their passions and seeking excitement in life. The way the ESFP always has a way of making the most out of a difficult situation, is truly inspirational. They follow their hearts and really just want to make life a fun experience, eager to bring their loved ones along for the ride. No one can have fun and party like the ESFP, and this is something many people can take for granted. They are able to put a smile on their face, even when things seem dark.